Majestic Wilderlands – When Scarecrows Attack! We start the game in combat, at a distance of no less than 200′ from the foes, which are two clawed scarecrow like things. The first event is screaming children and two scarecrows – of a likely six total, plus a theorized hag – and the scarecrows hit the older elf guy, knocking him to the earth. Marcus dashes up on his new warhorse (covers 120′) and still gets two sword blows in (or that’s how we did it) and hits twice for 18 HP; Marcus, in turn, gets clawed for 12 HP, down to 34HP. The other scarecrow claws ineffectively at Marcus’ horse. As the rest of the party closes, Keyar fires two fire arrows at the scarecrow Marcus just hit – double damage puts him down hard. Next turn, Marcus hits him with a bit of divine smite, my sword erupts in holy flame, and the second local scarecrow goes down. The paladin jumps down, lays on hands to the fallen “grandfather,” and he feels almost like he is both there and not there, at the same time. He thanks Marcus in the name of Veritas . . . but he complains of orcs. And we hear orcsong in the distance. Orc-hestral music, as it were. Vognur says that he saw someone with silver hair holding a horn duck into the trees to the North. Hmm. Someone’s setting us up, but he’s 550′ away – 180 yds. The children note that they were hungry, eating peaches. They’re lost, please help us. The orcs will be attacking . . .
Colin reminds us that there was a heroic last stand in the easter part of the forest that occurred because they were trying to save some children – this feels right to Marcus, who solidly suspects that we’re interacting with a figment or a remnant. We decide to light up the scarecrows with flame arrows and kill ’em with swords, just to be sure. Keyar proceeds to light ’em up with flame arrows, taking out two in two rounds. Two regular arrows from Marcus are probably an annoyance more than anything else. Marcus will enter the villa, and see if there’s a big bad somewhere in the center, while the rest of the party close in on the scarecrows. The rest of these guys are running and closing in. This is the longest-range D&D combat I’ve ever been involved in. Marcus rides into the middle of town, and detects evil strongly. This was what we suspected – a hag. She magic missile’s me, and rolls 3 1’s for damage. We shall call this hag . . . Tim ( +Tim Shorts, roller of quantum 1’s). We hear real orc screams to the North. Life is interesting. Marcus has cleverly drawn all the scarecrows and the hag to himself. His target will be the thick of combat, of course, and hopefully his compatriots will deal with the scarecrows. My plan is to burn as many spell slots as needed to defeat the hag in short order. We shall see. Marcus lays about him, two hits, two 2nd level spell slots, 52 HP total damage. She looks hurt, which is good, since that was a crit and more, plus the invocation of sacred weapon. A portal opens up in front of her, she becomes infinitely flat, and she disappears. I still sense evil where she was, but it it muted, as if through a veil. The rest of the scarecrows crowd around me, attacking and missing me, rather than my horse, which is good. Keyar continues to feather scarecrows effectively, killing one and wounding another. Marcus kills a visible scarecrow; he then senses the evil, and follows it north. He calls forth his paladin’s light, and sees a shadow on the ground, but no hag – she’s ethereal. Keyar feathers the last of the scarecrows, and the orcs continue to close from the North. I taunt the hag, and she says “you have no idea what you’re dealing with, High Lord’s lackey!” and she completely disappears from my senses. 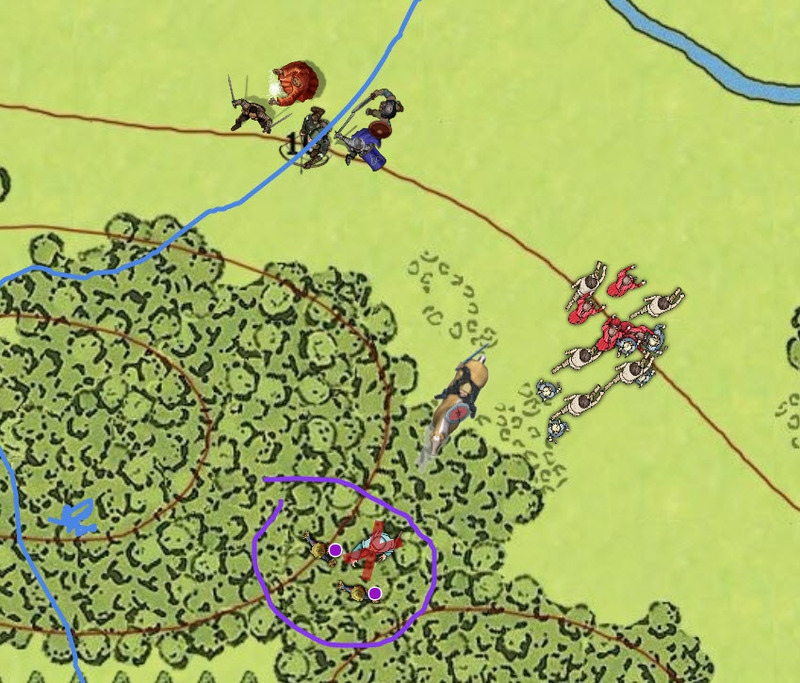 Orius casts fireball at the charging orcs, catching five in the spell’s range with a DC 16 save. Four take full damage, one takes half, He rolls 28 HP of damage . . . and none drop. Yow. Tough orcs. Colin flings a sleep spell, hits the middle 5 orcs (of 8) – and rolls 5d8 for 21 HP. Since the spell hits those with the lowest current HP, all five in the zone of effect drop for 10 rounds (one minute). We all turn to engage the orcs, of which there are three effectives left. Orius whips out the Wand of Magic Missiles and targets one of the orcs that is not hurt. We continue to whittle away at them, magic missile for some, Crown of Madness for the leader; alas. He makes his save. 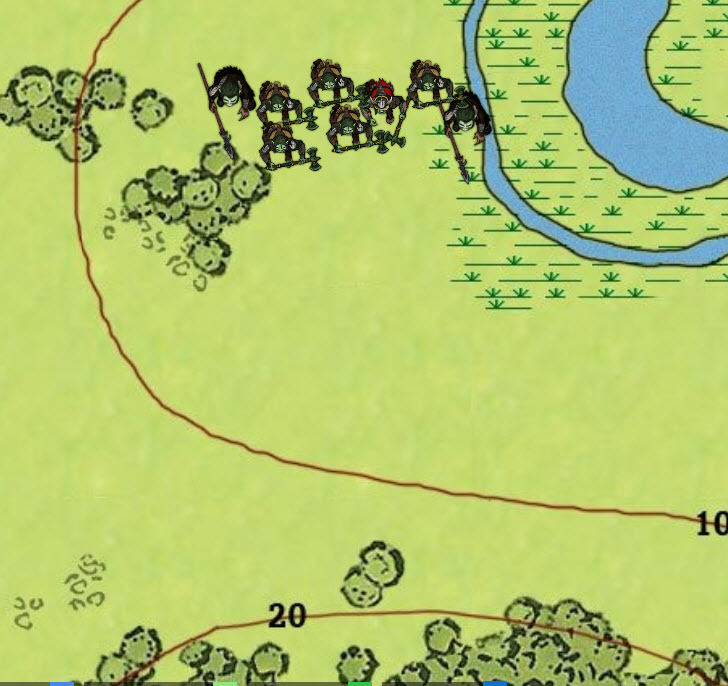 The orcs charge at us, up the hill, and a ghostly spear appears before them and accelerates up the hill to us. Colin tries Crown of Madness on the leader again, and Rob rolls 21 for his save. He’s also Hold Person’d. Marcus (with advantage from being on a horse on the top of a hill) hits an orc for 10 HP, while everyone else who’s out of range tries to get in range. Some orcs try and hit Marcus, but AC 24 is tough to beat. A phantom spear attacks Tim, rolls a crit (!) 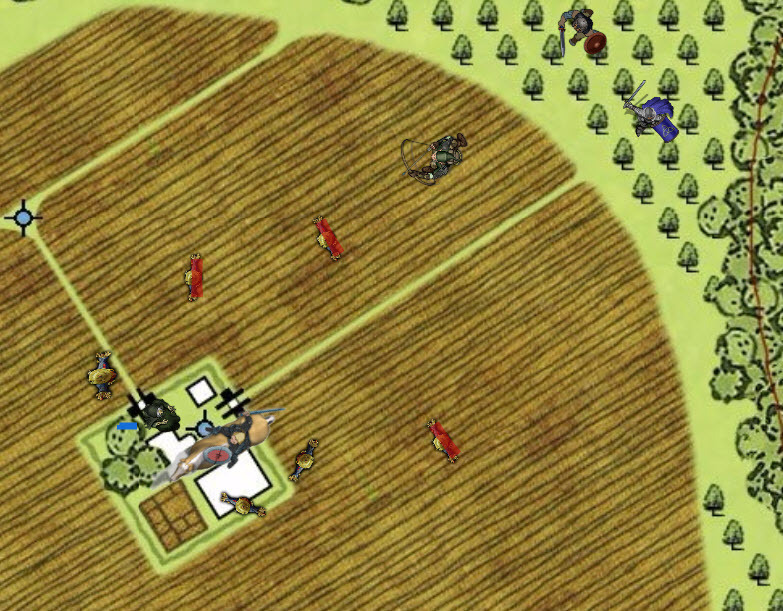 and hits for 11 HP; Vognur and his AC 21 is narrowly missed by another spear. We’re on round 5 of the sleep spell, and Keyar gains the top of the hill; an AC 16 target is hit for 19 HP plus two hunters’s marks, for 23 HP total (hit rolls of 26 and 28). We continue to fight – Marcus fells an orc, and he and his ghostly weapon both disappear. The orc chief breaks his Hold Person, more spears attack our buff wizard Orius, and Keyar hits a disengaging orc once, hunter’s mark, inspiration, and whatever. He goes down. Vognur tags the orc chief for 8 HP of slashing; Marcus throws in a few more on the orc chief, and we continue to whittle down the opposition, taking minor blows (thus far) in return. The attritive nature of D&D combat is a bit on full display here. The orc chief attacks Vognur, but Marcus uses his defensive fighting style to force disadvantage; three attacks all miss. Another magic missile from Orius hit home for 14HP; Colin McDaw hits twice for 17 HP, and the chief finally goes down. The war chief looks utterly surprised as he falls. We defeat the sleeping orcs, putting them out of their fey misery. Out of combat, Marcus heads back to the villa, and tries praying like crazy to Veritas to cleanse this villa and lay the spirits to rest. In the distance, we hear an orc horn again. Sounds like 3 miles away or so. Marcus finds standing stones with Runes of Protection; Keyar activates the powerful stones, motes of light streak away from the villa and the locale, as the children turn into pixies and fly away. As the spirits flee, we see a ghostly face, who asks us if we want to continue the story, and play out the remainder of the tale. It ended as it shouldn’t have, and he is upset. He drifts away on the wind. The taigh has not been revitalized, but we at least drove out the evil influence that had taken root here. We end there. We had a very, very good evening. We thwarted a greater sidhe lord via activating the standing stones, killed a bunch of scarecrows and orcs, and drove off a hag. Plus the treasure. Everyone gets 1,500 XP for the night – that’s quite a bit for one of Rob’s adventures, and it pushes Marcus to 6th level. The big bonus there is Aura or Protection – good for everyone else, not so much me. 6 HP extra. No extra spells, proficiency bonus, or powers that I can tell.